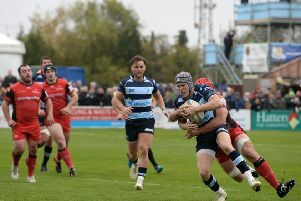 Bedford Blues second row star Mark Flanagan has been rewarded for his fine season by being snapped up by Premiership giants Saracens. The Irish lock, who has made 22 appearances for the Goldington Road side this season, joined the club last summer from French side Mont-de-Marson and quickly established himself as a mainstay in the scrum and a definite target in the lineout. Blues director of rugby Mike Rayer said: “Mark has had a great year for us and his efforts were duly rewarded with a move to Saracens. Saracens director of rugby Mark McCall told the club’s official website: “We have been watching Mark for some time and he has proved himself one of the most impressive lock forwards in the Championship. Meanwhile, Flanagan, 26, added: “Joining Saracens is fantastic opportunity for me. Sarries have a proven track record of developing players and I can’t wait to get started next season.